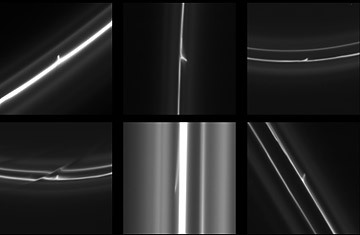 This set of six images obtained by NASA's Cassini spacecraft shows trails that were dragged out from Saturn's F ring by objects about a half mile (1 kilometer) in diameter. If the solar system were a neighborhood, Saturn would be the house that never takes down its Christmas lights. The other seven planets may be beautiful in their particular ways  Jupiter's gaudy stripes, Earth's watery blues, Mars's sunburnt ochers. But nothing touches the luminous, look-at-me splendor that is Saturn and its swirl of rings. Ever since Galileo first spotted the rings in 1610  and mistook them either for Saturnian jug ears or a pair of moons  astronomers have been trying to take their measure and understand their structure. And for all the close-up study by telescopes and visiting spacecraft, the rings continue to yield surprises. The latest came earlier this week during an astronomy conference in Vienna, Austria, when scientists working with NASA's Cassini spacecraft, which has been orbiting Saturn since 2004, revealed images of strange, icy jets emanating like needles from one of the planet's outermost bands and extending up to 110 mi (180 km) into space. What they are and how they formed are in turn yielding clues about how the solar system itself came to be. Saturn's ring system is actually a series of seven nested rings, with the innermost edge of the innermost one lying just 4,200 mi. (6,800 km) above Saturn's cloudtops and the outermost edge of the most distant band stretching 260,000 (418,000 km) into space  or greater than the distance from the Earth to the moon. It was in 1979 that the Pioneer 11 probe discovered the planet's F ring  the third most distant of the seven  and straightaway scientists knew there was something special about it. The ring is escorted by a pair of what are known as shepherding moons  Prometheus traveling along on the inside edge and Pandora on the outside. The gravity of the small satellites keep the boundaries of the F-ring sharp, but also gives rise to elaborate eddies and swirls within the ice and rubble that makes up the ring material. This gives the ring what appear to be kinks and knots and even something resembling braids. "The F ring is Saturn's weirdest ring," says Carl Murray of the Cassini imaging team. "[It is] like a bustling zoo of objects from a half mile in size to a hundred miles in size, creating a spectacular show." That show got more spectacular still when Murray and his team recently examined F ring images shot by Cassini on Jan. 30, 2009. They noticed what appeared to be a barb poking from the ring and tracked it backward over eight hours of earlier images. The formation, they discovered, was actually the icy trail of a 1-km (.62 mi.) object that originated from within the ring and was somehow fired from it. When the team sifted back through 20,000 other images from the spacecraft's first seven years at Saturn, they found 500 other such cosmic bullets leaving similar shimmery trails behind them. So what was creating that shooting gallery phenomenon? The answer, Murray and his group concluded, was principally Prometheus. The shepherding moon orbits so close to the edge of the F ring that it is actually slightly within it  a little like driving on the inside shoulder of a circular race track. As it moves through the river of ring material, it leaves a turbulent channel in its wake. The ripples this gives rise to can cause ice particles to coalesce into large snowballs. Investigators always assumed that these clumps break up as the channel closes and they collide with other objects  and most of them do. But some survive. As they bang about, they sometimes carom off of other objects and get knocked out of the ring altogether, dragging a trail of snow behind them. "We know what Prometheus does," says Murray in a web video of the Cassini images. "What we didn't know was what happens to the snowballs once they're created. Now we've got evidence that some of these little guys survive and go on to punch through the F ring." That's significant for more than just they sky show they put on. The formation of solar systems themselves is governed by the same physics of dust rivers that shape the Saturnian rings. We live in a solar system that long ago matured past its formative stage, but Saturn provides a smaller scale reenactment of how things may have played out. "Solar systems evolve out of disks that are similar to, but obviously much grander than, the disk we see around Saturn," says Lisa Spilker, a Cassini project scientist. "We can't wait to see what else Cassini will show us." The idea that Saturn can serve as a sort of proxy solar system will surely keep astronomers interested long after the Cassini mission ends in 2017. But even if the planet had nothing practical to teach, it would draw our attention all the same. That's always the case with the flashiest house on the block.